After over a year of contemplation, feedback, edits and advising, yesterday can only be described as a landmark for veterans’ and fraternal groups in the state of Ohio. Representative Rick Perales (R – Beavercreek) introduced House Bill 325 last night in the Ohio House of Representatives, asking for the Ohio Legislation to clarify the rules for charitable gaming in the state, and to continue the charitable efforts of veterans and fraternal organizations. To date, those charitable efforts have raised over $5,000,000 for charities in under two years. Rep. Perales, a 15-year veteran of the United States Air Force, knows clarifying the laws in Ohio is a dramatic step in continuing the charitable efforts of Ohio’s veterans’ and fraternal organizations. The full statement from Rep. Perales’s office can be found by clicking here. Stay tuned to the OVFCC Website and Blog for the most up to date information, as H.B. 325 moves through the legislature. In light of the recent comments of Ohio Attorney General Mike DeWine, at least one newspaper thinks that Mr. DeWine and the Ohio Legislature should give veterans’ and fraternal organizations a fair way to raise funds for their organizations and the over 400 charities they support. Appearing in the editorial section of the October 21st edition, the Intelligencer Wheeling News-Register feels the time has come for legislation that helps so many to be part of the legislative agenda for the Ohio State House of Representatives and the Senate. Legislators should consider allowing the electronic raffle machines, with tight limits intended to benefit only legitimate veterans’ and fraternal organizations. To date, the OVFCC electronic raffle program has raised over $5.5 million for charity, working with the Attorney General and the Ohio Legislature to create the most transparent and fair system of its kind. 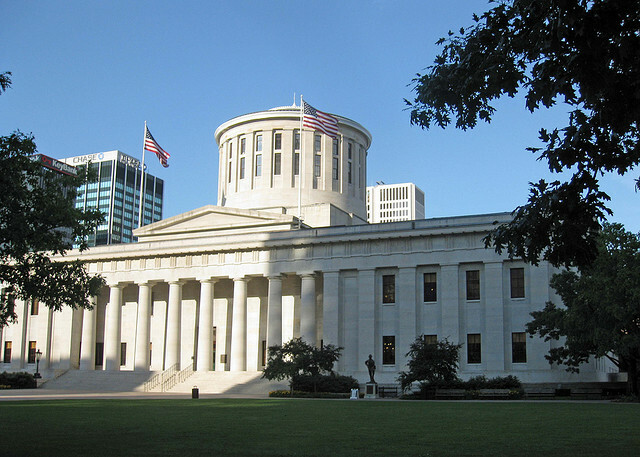 Recently, over 200 members of state-wide veteran and fraternal organizations gathered at the Ohio Statehouse in support of the OVFCC program, hoping to encourage legislators to take up the matter. As Ohio state legislators prepare to begin the 2013 Fall Session, the OVFCC calls on its members to stand in support of one another on Wednesday, October 16th at 11:00am at the Ohio Statehouse Building. The OVFCC supports legislation that benefits not only veterans and fraternal organizations, but also supports over 400 charities statewide. The state law must be clarified to allow charitable video gaming at veterans and fraternal organizations. It is imperative that we show our support for one another and for these charities on October 16th. The OVFCC offers the only form of gaming that benefits charities and we deserve the right to continue to conduct video gaming. We can’t afford to wait any longer! Free parking and shuttle service will be offered starting at 10:00am from Veterans’ Memorial at 300 West Broad Street in Downtown Columbus. For more information on this important, one-time event, please contact Bill Seagraves at bseagraves@ovfcc.org, or at 614.946.4099. More details about the event can be viewed on the attached PDF.